We are one of Bangor's historic downtown churches committed to ministering the gospel of Jesus Christ in word and deed. 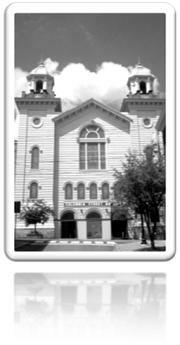 The stately building of Columbia Street Baptist Church stands today at the head of Cross Street as a strong witness to the power of God and His gospel in the lives of ordinary, dedicated Christians. In May 1845 a few young people from the First Baptist Church of Bangor opened a mission in Grey's Hall (known as "Old Bethel") on Broad Street to minister to the "destitute" and "tough" waterfront area of Bangor, then known as "the largest lumber-shipping port in the world." A description of Old Bethel reads: "The 8 years during which this church worshiped in the bare old hall, with its straight backed, unpainted wooden benches, its uncarpeted floors, and whale-oil lamps, were most fruitful in good results." On September 12, 1845 the mission was organized as a church, with 27 members. Rev. Charles G. Porter of Frankfort was the first pastor. By 1846 Mrs. Porter wrote to her mother: "It will rejoice you to hear of our prosperity -- we have a congregation of 200 to 300." It was time to look for a new building. On June 15, 1854 the public dedication of "the new and spacious sanctuary" known as the "Free House" on Columbia Street took place. In large letters on the front of the building the words "FREE HOUSE" assured that all seats were free -- no rental charges would be made. Over the years the church edifice and worship facilities have been renovated and improved by special gifts and the faithful stewardship of the church family. Some of the changes are included here. The steep steps of the original building were removed, the front redesigned, and two towers and stained glass windows added in 1902. In 1928 the Estey pipe organ was given, and the gift of a new baptistry graced the front of the sanctuary. The beautiful painting in the baptistry came later as a memorial gift. More recent gifts and improvements include organ chimes, a bell carillon, and a set of hand bells. A sound system, hearing assisted devices, and memorial hymnbooks also enhance our worship. In 1955-56 the addition of two wings enlarged our space, and in 1962 the purchase and renovation of the Nissen building next door gave us an education building housing classrooms, nursery, staff offices, and a large gymnasium. The gift of an elevator is greatly appreciated by those for whom stairs are difficult. An excellent, well-used library nurtures our minds, and a modern kitchen serves for fellowship meals and social times. The kitchen is also home to our Sunday Dinner, which is served free of charge to all who are hungry every Sunday from 12 to 1. This ministry for those in need was started by church members in 2009, and is supported by other local churches who serve from our facility. The church offices were relocated in late 2009 to make way for a beautiful, bright, and sunny facility to cater to the needs of our church's youngest worshipers. The Childrens' Center was officially "open for business" in September, 2010. We renovated the church gym in 2013-2014, adding a Climbing Wall and a new gym floor. This was followed in 2015-2016 by a major renovation of the downstairs portion of the church's building at 45 Columbia Street, which was then leased to the Columbia Street Project, a 501(c)3 faith-based non-profit organization founded by CSBC for the purpose of reaching out to those reentering the community from incarceration.